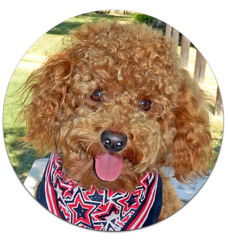 ​Rusty is a red AKC Miniature Poodle, who has 14 champions in his lineage. He has excellent health and healthy offspring . His personality is delightful; he is obedient; and he learns quickly. His puppies are adorable! Our veterinarian has evaluated his knees and describes them as excellent. Rusty is highly athletic.